I was born being able to see the Aura and I can now switch it on and off, which is just as well really but in this exercise I am going to try and explain how you can see this for yourself. When you begin to be able to view the Aura, you generally see the Etheric Body, there are several layers and this layer is closest to the physical body and is a complete blueprint of your physical body. 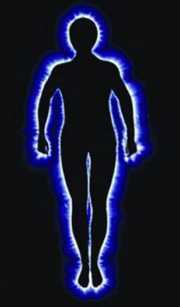 If you have had organs or limbs removed they will still be present in your Etheric Body. You will need at least one other person to do this exercise, they can be standing or sitting it doesn't matter however you will need to get them to stand or sit in front of a plain coloured wall. Some people prefer a light coloured wall others a dark, it's what works best for you and you can try both. With your partner placed in front of the wall and it doesn't matter if they are facing you or facing away open your eyes wide, now its a bit difficult to describe but you have to allow your eyes to go floppy and to let your vision relax as if day dreaming and out of focus, but here is the tricky part. You stare at your partner until it gets uncomfortable and just before you have to blink you will get a perfect view of the Etheric body. Now this layer has a distinctive beautiful colour that radiates from the physical. I wont lead you on and tell you what colour it is as I want you to see this for yourself. After you have practised this a few times you will be able to view this layer a lot easier.